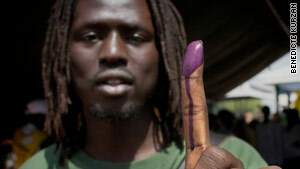 Rapper Emmanuel Jal worked with a singer from the north to produce "Ceasefire" but voted for independence. Khartoum, Sudan (CNN) -- The bumping beats of African percussion and contemporary hip-hop meet the smooth rhythms of a classic Middle Eastern oud. A confident, youthful rapper's conscience, spat out in Dinka, Nuer and English, unites with poetic Arabic lyrics of love and peace, mixing the sounds of north Sudan and its independence-seeking southern region. It is the music of "Ceasefire," a 2005 collaboration between Southern Sudanese rapper Emmanuel Jal and northern Sudanese singer Abdel-Gadir Salim, a musical effort to fix the failures of politics. It was the product of a respected musician and a former child soldier, and both are now hoping for better things after Southern Sudan's vote on independence. Jal, born sometime in the early 1980s in the south of Sudan, was a boy when Sudan's second civil war broke out in 1983. He was later recruited by the Sudanese People's Liberation Army (SPLA), a rebel group fighting the government. His early life was that of a child soldier, a young firsthand witness to war. His spoken words of awareness and spirituality, which reflect his painful experiences and are set to the background of African percussion and American hip-hop beats, gained him recognition in Kenya and the United Kingdom with his first album, "Gua." His second album, 'Ceasefire,' with northern singer Abdel-Gadir Salim, took him even further. His lyrics expand the spectrum, from polite love songs to calls for social harmony and unity. "The idea was to talk to people through music...it was an effort to make unity attractive," says Jal, who spoke to CNN.com via phone from Nairobi, Kenya. In January 2005, 10 months before the release of "Ceasefire," the government of Sudan and the SPLM/A signed a peace agreement in the Kenyan resort town Naivasha to end decades of war between the north and south. Salim was also thrilled with the idea of 'Ceasefire.' "For me it was an amazing idea and I was very happy with it," he says. "It was an attempt to focus on human feelings and show the diversity of Sudan through music," he adds. "It was celebrated globally and introduced us to an international audience." Since 'Ceasefire," Salim has performed in places like Stockholm, Barcelona, and Washington, D.C. Jal's rising stardom and humanitarian activism took him to performances at Live 8 and Nelson Mandela's 90th Birthday Concert. Six years after the peace agreement and just before last week's South Sudan Independence Referendum on whether to keep Sudan united or make it separate, both singers were active in promoting the causes of peace and unity. Jal initiated a global campaign with the release of his latest single "We Want Peace." A YouTube hit, the video features endorsements from celebrities such as singers Alicia Keys and Peter Gabriel, actor George Clooney, former U.N. Secretary-General Kofi Annan and former U.S. President Jimmy Carter. Salim performed concerts in Southern Sudan's major cities like Juba, Kuajok and Aweil with a new song, "Let us not divide the nation," in which he sings: "Let us not divide the nation / Let us not be two Sudans / Let us be one Sudan." So did "Ceasefire" fail to deliver its message? Jal says. "I think the government is to blame... [It] did not do anything. 'Ceasefire' was meant to reach people emotionally; I did my best to deliver the message." Other than one joint performance by Jal and Salim at Khartoum's elegant Nubian Club in 2006, organized by U.N. staff, "Ceasefire" did not receive the attention it should have in Sudan, Salim said. "I think we [Sudanese] did not celebrate the Naivasha Peace Agreement as we should have; it stopped the war, and nothing was better," he says. Salim added. "'Ceasefire' may have failed in Sudan, but it was a success globally, especially if you consider Jal's story; he was a child soldier." In the track 'Baai' a line promoting unity goes: "We gotta come together/bond together/do everything to be together." "People in the north feel oppression but don't talk about it," says Jal. "What happened in the south is a big lesson for the central government to pay attention to the peripheries...I am sure that this painful lesson will not occur again." Looking forward, Jal hopes that Sudanese in the north and south eventually will realize "we are actually one people." "Peace in Sudan could have happened ... the DNA of the people in the north is the same DNA of the people in the south," he says. Salim, reflecting on a life-time career calling for unity, says: "Separation is painful and harsh, but if this is what southern Sudanese want, they should be able to choose their path. The most important thing is peace, peace, peace."